When I was a kid, my family had a massive, fake-wood-paneled 1973 Ford LTD Country Squire wagon. It was the size of a rural county and almost as nimble to drive. As an American car of the 1970s, it was laden with wreaths and crests and all sorts of synthetic heraldry. It also prominently featured badges with what appeared to be three very stylized cats on them. What the hell was that about? There was nothing about the car that was remotely feline; it wasn’t a Cougar, after all, which had its own, different big cat badge and ornamentation. It wasn’t named for anything cat-like, there wasn’t a feline-themed option package, the thing barely had one life, and yet it was adorned all over the place with these three stylized cats, usually constrained within the elegant fencing of some kind of wreath. So, again, why? What’s the deal with the cats? I did a bit of digging, and it turns out those unexplained cats aren’t cats (well, not house cats, at least) at all—they’re lions, which makes a bit more sense from a marketing perspective, I assume, since lions have qualities other than “great at napping” and “really enjoys discarded string” that a clever advertising writer could use when analogizing the car’s power and speed in hyperbolic ad copy. But those lions weren’t there for marketing reasons, really, and they weren’t unique to the Ford LTD: Ford had started using three lions on its badging since 1950, when, free from a number of constraints following Henry Ford’s death, the company began making some changes, one of which was abandoning the old and now iconic Ford calligraphic script logo for more modern designs. The first cars to not use the Ford script logo came in 1949, and lacked any real badges or logos at all, featuring just bold block letters that spelled FORD in an arc around the grille’s central torpedo-head design. 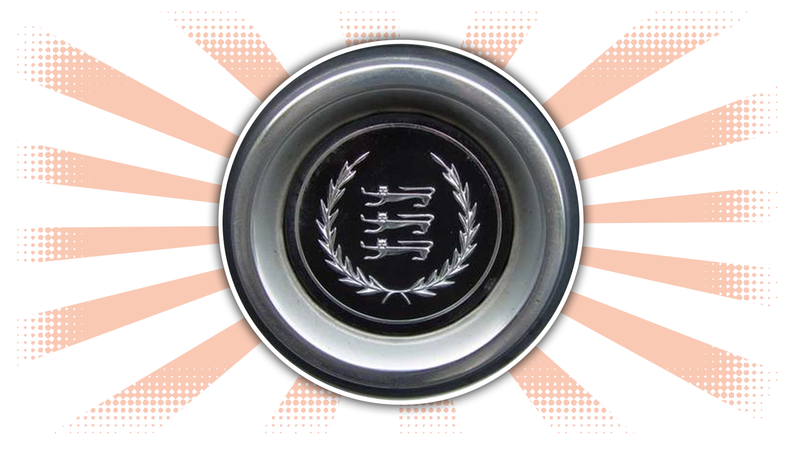 It wasn’t long until the marketing people decided they wanted a new Ford badge to use, so in 1950 a new logo/badge was designed that “dates back to 18th century England,” according to Ford, and was designed to look like an old English heraldic crest, with a black chevron with silver spheres dividing a shield into three sections, one blue, one red, one gray. In each of these three sections rested, you guessed it, a lion. The idea of making a medieval-style crest for a car whose modernity you want to emphasize seems a bit misguided to me, but what do I know? I’m not a long-dead mid-century ad executive, after all. That crest right there would have been pretty at home just as it is on the steering wheel of a 1976 Ford LTD. So, the reason so many 1970s Fords had hubcaps and hood ornaments and badges with three cats is that the cats are actually lions, and those three lions are there because Ford marketing people after Henry Ford’s death wanted a more modern logo, so to achieve that they looked back to the 1300s and repurposed the coat of arms of a long-dead English king to represent one of the leading carmakers from a country whose very founding was all about never having to deal with kings ever again. Is That Really A Snake Eating A Guy On The Alfa Logo?